The Lulu’s tody-flycatcher or Johnson’s tody-flycatcher (Poecilotriccus luluae) is a species of bird in the Tyrannidae family. It was briefly known as Lulu’s tody-tyrant, but following the death of Ned K. Johnson, one of the people responsible for the description of this species in 2001, the name was modified to Johnson’s tody-tyrant by the SACC. Following the move of this species to the genus Poecilotriccus from Todirostrum, it was recommended modifying the name to tody-flycatcher. It is endemic to humid thickets, usually near bamboo, in the highlands of Amazonas and San Martín in northern Peru. It is threatened by habitat loss and is consequently considered endangered by BirdLife International and IUCN. 10 cm. Small, well marked tyrant flycatcher. The most striking feature is the rich chestnut-red hood (except small white throat). Hind neck band is grey/black and remaining upperparts are green, with coverts, tertials and secondaries fringed yellow. Below the hood is a narrow, white breast band, and the remainder of the underparts are bright yellow. Voice Call is an emphatic chick. Song probably consists of a short, rather harsh trilling. Poecilotriccus luluae is known from six localities in north-east Peru: at Wicsocunga, near Lonya Grande, in the northernmost extension of the Cordillera Central (T. Mark in litt. 2003); two sites in the Cordillera de Colán (30 km east of Florida (Johnson and Jones 2001), and south-east of Bagua (Davies et al. (1994)); and three areas to the east in an unnamed range in the Eastern Andes (the García area north-east of Abra Patricia; 6 km south-east of Corosha; and 33 km north-east of Ingenio) (Johnson and Jones 2001; Davies et al. 1994). 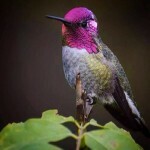 Anna’s hummingbird (Calypte anna) is a medium-sized stocky hummingbird native to the west coast of North America. This bird was named after Anna Masséna, Duchess of Rivoli. In the early 20th century, Anna’s hummingbird bred only in northern Baja California and southern California. The transplanting of exotic ornamental plants in residential areas throughout the Pacific coast and inland deserts provided expanded nectar and nesting sites, and the species was able to expand its breeding range greatly. Anna’s hummingbird is 3.9 to 4.3 in (9.9 to 10.9 cm) long. It has an iridescent bronze-green back, a pale grey chest and belly, and green flanks. Its bill is long, straight and slender. The adult male has an iridescent crimson-red derived from magenta to a reddish-pink crown and gorget, which can look dull brown or gray without direct sunlight, and a dark, slightly forked tail. Female Anna’s hummingbirds also have iridescent red gorgets, though they are usually smaller and less brilliant than the males’. Anna’s is the only North American hummingbird species with a red crown. Females and juvenile males have a dull green crown, a grey throat with or without some red iridescence, a grey chest and belly, and a dark, rounded tail with white tips on the outer feathers. These birds feed on nectar from flowers using a long extendable tongue. They also consume small insects and other arthropods caught in flight or glean from vegetation. A PBS documentary shows how Anna’s hummingbirds eat flying insects. They aim for the flying insect, then open their beaks very wide. That technique has a greater success rate than trying to aim the end of a long beak at the insect. On rare occasions, bees and wasps may become impaled on the bill of an Anna’s hummingbird, causing the bird to starve to death. While collecting nectar, they also assist in plant pollination. This species sometimes consumes tree sap. The male’s call is scratchy metallic, and it perches above head-level in trees and shrubs. They are frequently seen in backyards and parks, and commonly found at feeders and flowering plants. Open-wooded or shrubby areas and mountain meadows along the Pacific coast from British Columbia to Arizona make up C. anna’s breeding habitat. The female raises the young without the assistance of the male. The female bird builds a nest in a shrub or tree, in vines, or attached to wires or other artificial substrates. The round, 3.8-to-5.1-centimetre (1.5 to 2.0 in) diameter nest is constructed of plant fibers, downy feathers and animal hair; the exterior is camouflageed with chips of lichen, plant debris, and occasionally urban detritus such as paint chips and cigarette paper. The nest materials are bound together with spider silk. They are known to nest as early as mid-December and as late as June. Unlike most northern temperate hummingbirds, the male Anna’s hummingbird sings during courtship. The song is thin and squeaky, interspersed with buzzes and chirps, and is drawn to over 10 seconds in duration. During the breeding season, males can be observed performing a remarkable display, called a display dive, on their territories. The males also use the dive display to drive away rivals or intruders of other species. When a female flies onto a male’s territory, he rises up approximately 130 ft (40 m) before diving over the recipient. As he approaches the bottom of the dive the males reach an average speed of 27 m/s (89 ft/s), which is 385 body lengths per second. At the bottom of the dive the male travels 23 m/s (51 mph), and produces a loud sound described by some as an “explosive squeak” with his outer tail-feathers.